This picture is from Steve Carver, a 2006 member of Revolution. My name is Steve Carver, I'm a sophomore civil engineering major at Texas A&M, and I marched contra in Revolution this summer. This is a picture after our last rehearsal of the season. 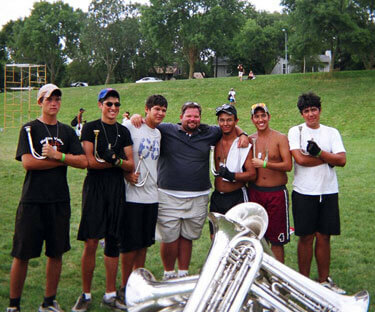 From left to right: Josh, me, Julio, caption head Jason Harvey, Contra Jake, Jake and Kevin. Thanks for a great season!